The food scene of Kolkata is something to behold, with its many variants and multiple cuisines. But perhaps the most famous food variant of Kolkata is its street food. 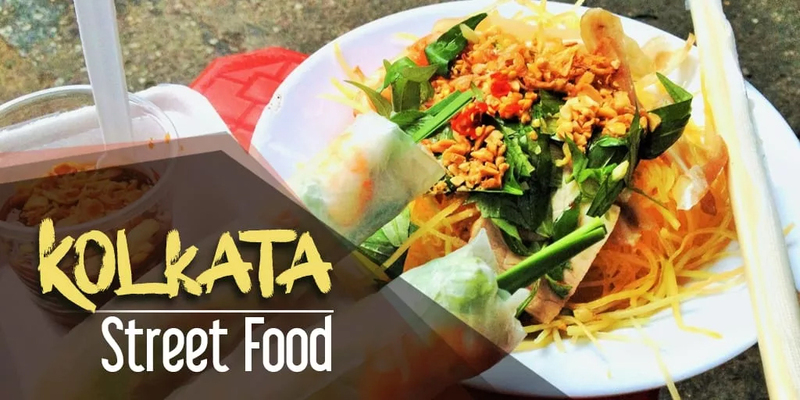 You will be astounded to find out the number of items that are sold all over the city as street food – the list literally goes on and on. So today, we have selected the top 10 Kolkata street foods that truly define the food scene of the city. Read on to find out more. A perfect mixture of puffed rice or muri, chopped onions and boiled potatoes, crushed papri or wheat flour biscuits, and topped off with tamarind and sweet chilli chutney and bhujiya or sev – bhelpuri is the ultimate street food for any food lover in the city. Bhelpuri is served in a newspaper cone with a wooden spoon, which definitely enhances its taste. There are two main aspects behind the brilliance of phuchka or pani puri. The first aspect is the lightness of the pastry shell, and the second aspect is the super tasty and spicy tamarind water which fills up the shell. The mashed potato mixture, containing pulses, chopped chillies, masalas, and lime juice, is another brilliant aspect of phuchka which makes it perhaps the most popular street food of not only Kolkata, but many other cities like Delhi and Mumbai as well, although the nomenclature differs a bit. If you are not into the messy and wet phuchka, you can definitely go for churmur, which is basically a mashed variant of a phuchka only. All the ingredients that we have mentioned above are used in a plate of churmur as well, which is topped off with sweet and sour chutney to enhance its taste. This is perhaps the biggest and best example of diversification of product portfolio, especially in case of food. Telebhaja is basically a multitude of vegetables coated in a batter made with besan and rice flour, deep fried in hot oil. You simply cannot imagine the number of variants available not only in Kolkata, but all over West Bengal. Some of the most popular variants include eggplant or beguni, potato or alur chop, onions or peyaji, pumpkin or kumri, etc. If you are into sea food, you will definitely love the fish fries, fish chops and fish cutlets available in multiple parts of the city. And if you are into poultry and meat, then you will simply have your mind blown by the many variants of foul cutlets, mutton cutlets, mutton chops, etc. The speciality of mutton chops is the layer of mashed potato around the ground meat, as well as the outside coating, which is a fine mixture of bread crumbs, besan and rice flour, which gives it a crumbly feel once deep fried. Now coming back to the foul cutlet – it is one of the finest street foods served in Kolkata, and definitely worth a try, especially with ketchup, mustard sauce, chopped cucumber and onions. Kathi rolls are the specialty of Kolkata. No other city can make a kathi roll the way Kolkata roll shops do. A kathi roll is a mughlai paratha with a filling of beef, lamb or chicken kababs, or even an omelette, topped off with chopped chillies, chopped onions and cucumber, tomato ketchup, chilli sauce, lime juice and ground black pepper, and rolled in the shape of a wrap. If you want a good kathi roll, filled to the brim with meat and toppings, you have to wait in a long queue in front of almost every roll shop in the city – they are that much delicious and heavenly. We have talked about fish chops and mutton chops, but now comes the king of all chops – egg chop or dimer devil. Imagine spicy mashed potato surrounding one half or one full boiled egg, and the entire thing covered with a batter of besan, rice flour and bread crumbs, and deep fried. The explosion of taste and flavours you will experience when you take one bite of a dimer devil is truly mesmerising. Another street food that is a native Kolkatan – jhal muri is a unique mixture of muri, coconut chunks, lentils, spicy chutney, mustard oil, chopped chillies and onions, and peanuts. Jhal muri is served in a packet made with recycled newspaper, and is a staple food for almost 90% of Kolkatans, no matter where they are or what they might be doing. And the best thing about jhalmuri is that it can be made at home as well – you can put your own little twist on it to come up with your own unique version. Mumbaikars might call it Ragda, but to the thousands of citizens of Kolkata, the word Ghugni represents gastronomic romance. Ghugni is made with boiled white or yellow peas, mixed with ground spices, ginger paste, and various other spices, and served on a plate with sweet tamarind chutney, chopped onions, cucumber, carrots and chillies, and sev or bhujiya. You cannot even imagine how good such a mixture might taste – you have to try it to experience it. Made with fresh cottage cheese, channar jilipi is basically a TWISTED cousin of the gulab jamun we are all so fond of. The design of this succulent and delicious sweet is inspired by the twists and swirls of the jalebi, and can be found in almost every Bengali sweet shop in and around Kolkata. Just imagine – something that looks like a jalebi but tastes like a gulab jamun – truly heavenly.